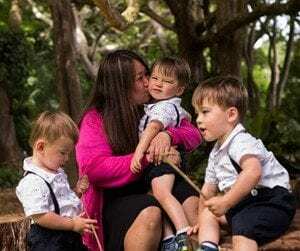 Michelle Kang-Mosher and her husband, Jeff, tried starting a family as soon as they got married in 2012. Considering their age, they sought medical help after not being able to get pregnant on their own. After one year of unsuccessful intrauterine inseminations and three in virto fertilization attempts, the Kang-Moshers still had hope. At their first ultrasound after the fourth IVF attempt, Michelle and Jeff were not expecting to hear three different heart beats. At age 42, Michelle was diagnosed was a high-risk pregnancy with multiples (triplets) and advanced maternal age. Because of her age, she was most concerned about carrying her babies to a healthy delivery. Throughout her pregnancy, Michelle was monitored by Kapiolani Medical Center for Women & Children’s Maternal and Fetal Medicine Specialists Drs. Janet Burlingame and Marguerite Bartholemew and went in for regular ultrasounds to ensure that her babies were growing and developing well. Michelle ended up at Kapiolani much earlier than she would have liked because one of the boys’ heart rates dropped at a routine checkup. At 33 1/2 weeks, Michelle gave birth to three healthy boys via cesarean section. After the c-section, she was hospitalized in Kapiolani’s new Medical Surgical Unit in the Diamond Head Tower. Her sons were the first triplets in the new Neonatal Intensive Care Unit (NICU). Today, the boys are 22 months old and Michlle says that if you look at them, you would never guess hey were born prematurely.